This huge meat eater was 45 feet long (5 feet longer than T-rex) and weighed 8 tons, making it one of the largest carnivores that ever walked the earth. This African carnosaur had a gigantic 5’4″ long skull and enormous jaws with 8″ long serrated teeth. It walked on two legs, had a massive tail, bulky body and short arms ending in three-fingered hands with sharp claws. 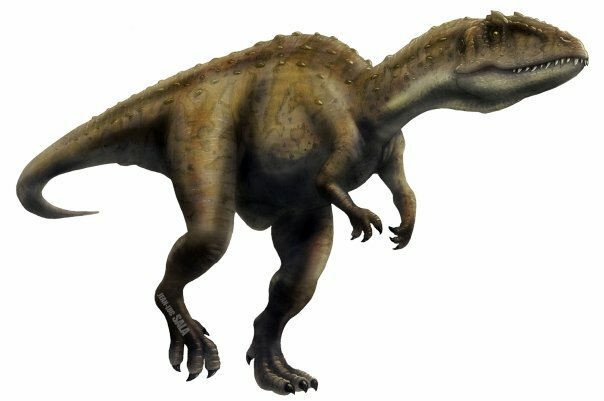 Carcharodontosaurus is one of the longest and heaviest known carnivorous dinosaurs, with various scientists proposing length estimates ranging between 12 and 13 m (39-43.5 ft) and weight estimates between 6 and 15 metric tons. 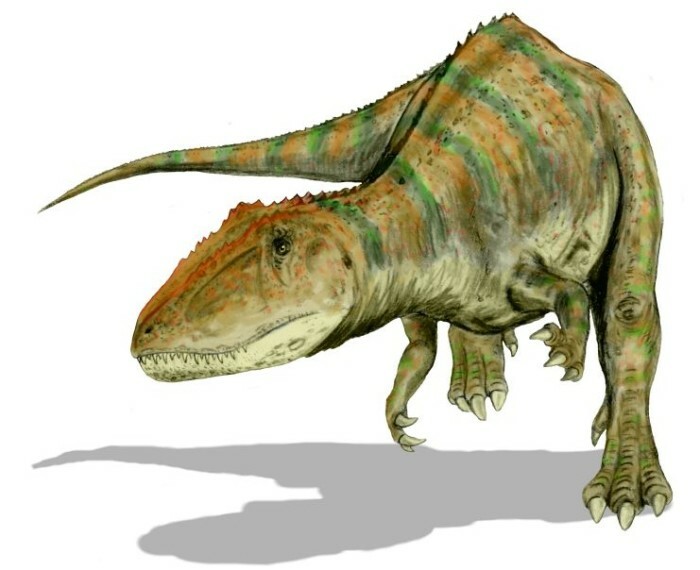 Its long, muscular legs, and fossilized trackways indicate that it could run about 20 miles per hour, though there is some controversy as to whether it actually did, a forward fall would have been deadly to Carcharodontosaurus, due to the inability of its small arms to brace the animal when it landed. Carcharodontosaurus was a carnivore, with enormous jaws and long, serrated teeth up to eight inches long. Carcharodontosaurus is named after its long sharp teeth with their deadly serrations. It is also known as the ‘shark-toothed’ or ‘jagged-toothed’ lizard. Its teeth would have slashed through flesh with ease, making it one of the most feared and successful meat-eating dinosaurs of North Africa. It was also one of the longest and heaviest, being slightly larger than North America’s Tyrannosaurus rex, although its brain was probably smaller. Two teeth were first identified in Algeria in 1927 and more findings followed in the 1990’s. It is highly likely that Carcharodontosaurus would have come into conflict with the largest carnivorous dinosaur of all time – Spinosaurus. This would have been a battle of epic proportions.